Established just as the 21st Century started, INNOVA ART is not bound by century old thinking and paradigms. They utilise their own specialist team of chemists to research and develop modern, flexible approaches to the manufacture of inkjet art papers. Motivated by a desire to deliver high quality products and value to their network of distribution partners as well as the end consumer, INNOVA ART is always seeking to forge new partnerships and create innovative products for the fine art print sector. INNOVA ART offers a selection of award winning digital fine art and photographic media alongside a range of innovative image display products. One of a few manufacturers worldwide dedicated to the art of producing media compatible with inkjet printers, INNOVA ART does not just redevelop traditional fine art papers, they create specialist digital fine art paper and canvas. TORPEDO, INNOVA ART's french distributor, founded in 1994, offers hardware solutions and consumables for the digital printing market. We are now specialized in selling high quality papers for ink jet and laser printers, in different weights and various formats. 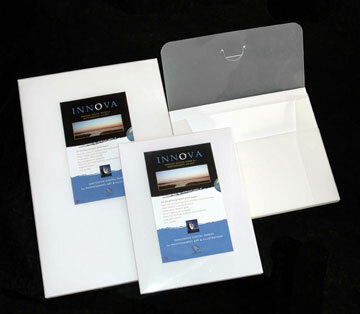 TORPEDO is selling high end INNOVA ART Archival papers for more than ten years. These Photo and Fine Art papers are made for artists as photographs, painters or illustrators. Every INNOVA ART paper, Soft or Rough textured Natural Weight, 100% cotton papers, Baryta glossy matte or satin papers is tailored for printing images the best way. TORPEDO is also offering, with the brand Xanté, a complete offer of hardware printing solutions in color for the graphic industry.